NETWORK UPDATE: Could things get worse for STATE OF AFFAIRS? Yes they could: final numbers pushed the show down 0.1 to an even deeper series low of 0.7. Also down 0.1 were THE BACHELOR, now at 1.7, and CASTLE, now at 1.3. We’ll have more detail about just how big ESPN’s first-ever COLLEGE FOOTBALL PLAYOFFS CHAMPIONSHIP GAME was in an upcoming SKEDBALL post, but the game set an all-time cable record with an 11.02 rating in 18-49s (and an astounding 20.69 with Men over 50 years old), and 33.25M total viewers. It goes without saying that nothing else came remotely close to the game, but on the other hand it didn’t hurt Monday’s other cable programming too badly. LOVE & HIP-HOP (VH1) lost 0.12 to 1.36, and lead-out SORORITY SISTERS was down 0.15 to 0.55. 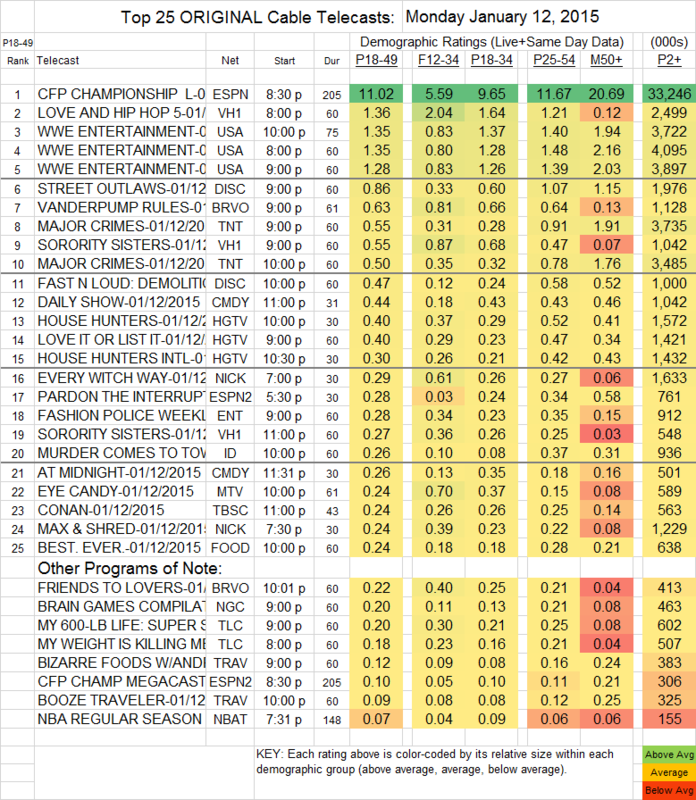 USA’s WWE coverage was at 1.35-1.28, actually slightly higher than last week’s 1.29-1.24. Discovery’s STREET OUTLAWS took more of a hit, down 0.24 to 0.86, with FAST N LOUD: DEMOLITION off 0.11 to 0.47. The 2-hour season finale of MAJOR CRIMES (TNT) was at 0.55/0.50, down from last week’s 0.65. Bravo’s VANDERPUMP RULES dropped 0.07 to 0.63, with the new FRIENDS TO LOVERS off to an unpromising start at 0.22. MTV’s new thriller EYE CANDY debuted with an inauspicious 0.24.